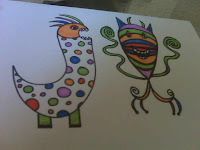 Kate and Oli: My Newest Monsters! I drew these up yesterday and am probably going to offer them as prints and as cards once I get them finished! Aren't they cute? There are about 6 other pages as well! LOVE new stuff!